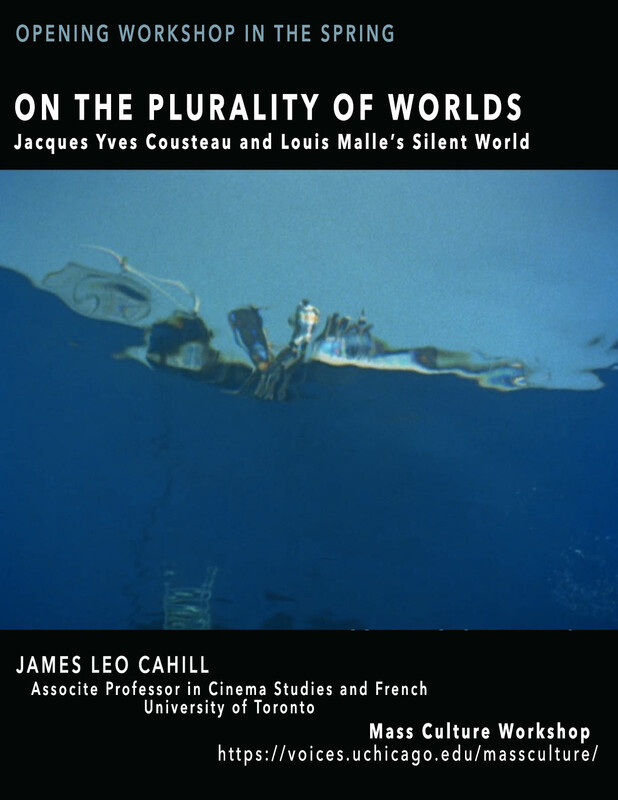 We invite you to join us on Friday, March 30th at 11:00 AM in Cobb 311 as Mass Culture Workshop is proud to host James Leo Cahill, Associate Professor in Cinema Studies Institute and Department of French at the University of Toronto; he will discuss “On the Plurality of Worlds: Jacques Yves Cousteau and Louis Malle’s Silent World,” a work in progress that will become part of his next book. We look forward to seeing you at the opening workshop this quarter! If cinematic media may be understood to have a Copernican potential, whereby they may be used as instruments of scientific discovery and displacement of anthropocentric perspectives, how does such a potential change how one conceives of the world or even constructs—or for the historian reconstructs—new ones? Drawing from archival research and contemporaneous film criticism and theory (Bazin, Thévenot, Agel, Epstein), philosophy (Merleau-Ponty), and anti-colonialist critique (Césaire), this talk traces how filmmakers in metropolitan France began to address these questions through the re-emergence of a cinema of exploration in the late 1940s and 1950s. These films were produced at the very moment when the question of the world as conceived by the traditions of French humanism and its universalist aspirations were called into question by crises of wartime collaboration, the persistence of colonialism, and coca-colonization (the ascendant American economic and cultural hegemony). Such films participate in these discourses at a sensuous level, while also offering historians unexpected documents for writing a very different history of cinema. Focusing in particular on Jacques Yves Cousteau and Louis Malle’s Le Monde du Silence (The Silent World, 1956), the most popular and aesthetically ambitious production of this cycle of exploration films, I read these films for the plurality of worlds they simultaneously archived and imagined, and call for a protocol of research and reading that sounds such material for a tendentiously anti-imperialist, anti-anthropocentric concept for the writing a natural history of the cinema. James Leo Cahill is Associate Professor Cinema Studies Institute and Department of French at the University of Toronto, and an editor of Discourse: journal for theoretical studies in media and culture. His writing on cinema and media history and theory has appeared in Discourse, Empedocles, Framework, Journal of Visual Culture, Kunstforum International, Spectator and the edited anthologies Screening Nature: Cinema Beyond the Human (Palgrave), Animal Life and the Moving Image (BFI), The New Silent Cinema (AFI), and Martin Arnold: Gross Anatomies. His monograph Cinema’s Copernican Vocation: Zoological Surrealism and the Early Films of Jean Painlevé is forthcoming in autumn 2018 from the University of Minnesota Press and he is presently co-editing with Luca Caminati Cinema and Exploration: Essays on An Adventurous Film Practice for the American Film Institute series. There will be no pre-circulated papers. Lunch will be provided. So bring your appetite.